The Pacific theme features premium product and collection page templates to display your products, convey their value, and boost your sales. The content for the product and collection (images, description, etc.) is largely added and organized in the Products admin, so once these components are added, you can start customizing these pages through the theme editor. The Product page highlights the features and benefits of individual products. It should contain the product title, images, description, price, and add-to-cart (ATC) button. These will each appear by default, so navigate to the theme editor to access and configure the product page features offered by the theme. To get here, go to Customize > Open up any product page in the right-side preview or select Product pages from the page selector dropdown > In the left-side settings, there will now be a section titled Product page > Open this to access these theme features. Selecting Enable zoom allows customers to view product images with more detail. When enabled, customers can hover the cursor over the main image and a magnifying glass icon will appear, prompting a closer view of the image. To use this feature, confirm that the product images have a width of at least 1600px. 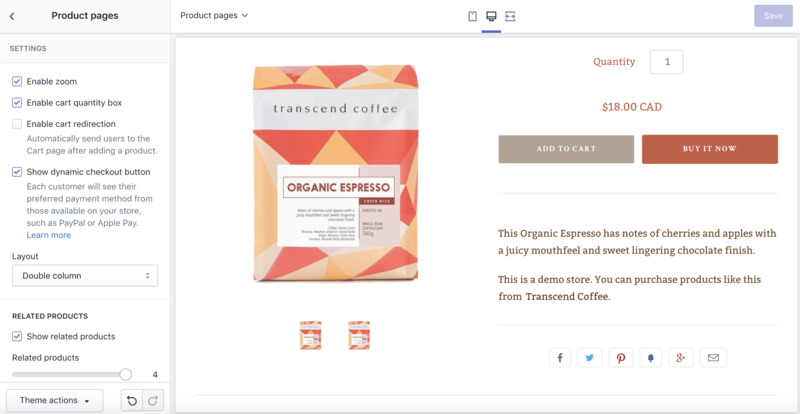 Enable cart quantity box indicates that a box will display on your product pages where users can input the quantity of a product they would like to purchase. Enable cart redirection brings customers to the Cart page automatically after adding a product to their cart. This option would disable AJAX, a function that keeps the customer on the product page following add-to-cart (ATC) activation. Show dynamic checkout button adds a customer-specific ATC button that directs to the Checkout page. If there are important features or apps on your Cart page, you can disable this feature. For more information on Dynamic checkout buttons, check out the Shopify help center. You can also select the Layout for your product pages from the dropdown menu. Pacific offers two product page layouts: Single column and Double column. For window and device widths below a certain point, the single column will be active even if double is enabled in the settings. Enabling Show related products allows customers to discover other items similar to what they are currently viewing. The products in this feature are automatically pulled from the same collection(s) as the product in view. You can specify the Number of related products that display from the dropdown menu. If the product belongs to multiple collections, it will pull from the first one (alphabetically). This can be troublesome if an "All products"-style collection is made—because this kind of collection would contain every product and the collection's title would likely be first alphabetically, this would include any and all products as related, regardless of similarity. A Collection page displays all of the products in a given collection. 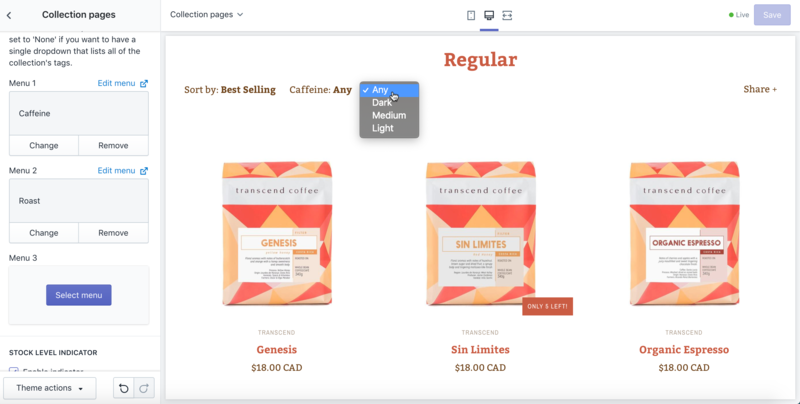 Compose and organize collections through the Shopify admin, then customize your Collection pages in Pacific's theme editor. Choose the Layout of your collection pages from the dropdown menu at the top. Pacific's collection pages come with two different layout styles: Grid and Collage. You can also specify the Rows and Products per row that display on your collection pages using the corresponding dropdown menus. Enable sorting allows customers to find and view products on your collection pages using a set of options provided in an on-screen dropdown menu. Go to Online store > Navigation, then create a menu for a category of tags you’d like to filter, e.g. “Color” or "Size." In this example, a category for Caffeine and Roast will be created. The links associated with each menu item don't matter in this case, so adding '#' or Home page here will suffice. Add as many links as you have tags for that category, e.g. “Caffeine, Decaf” or "Dark, Medium, Light." Add tags to the relevant products. Back in the theme editor, select the category menus to feature as filters from Select menu button under Menu 1, 2, and 3. 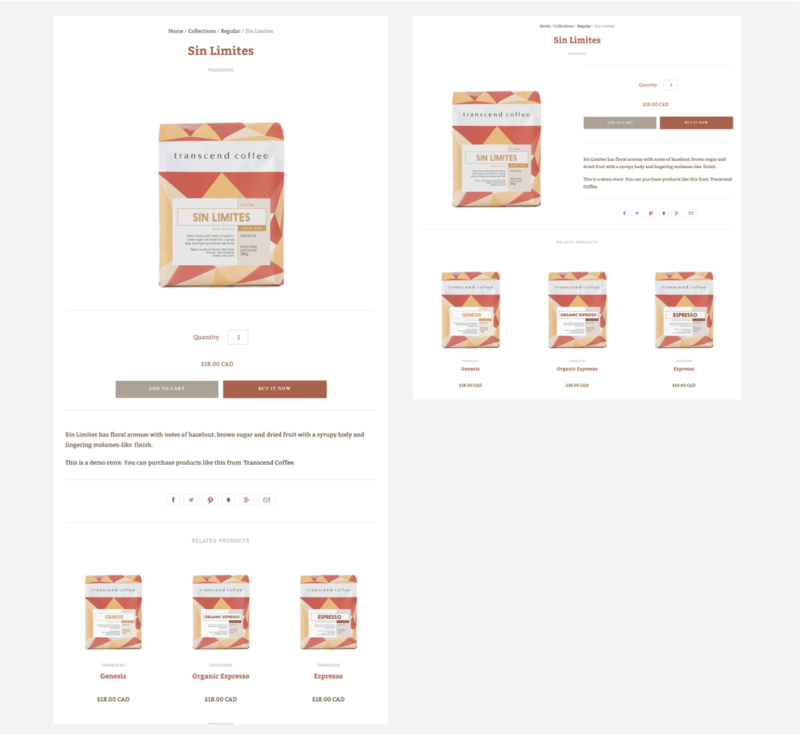 Your menu choices will appear on your Collection pages above your products in the preview. Clicking on one of them (in this example, "Roast") will reveal the tags determining which products appear. Pacific provides a Stock level indicator that accompanies your products, prompting customers to purchase quickly when supplies are limited. Check Enable indicator, then adjust the slider below to identify when the warning will appear. The Collections list page displays an index of your store's collections. To access the settings for this page, navigate to your Collections list page in the theme editor and then click Collection listings under the Sections tab. You can control the number of Collections per row (max 3) and Rows (max 10) by adjusting the respective sliders. Using the Text style option, set the title text to Overlay or Under image. Additionally, you can choose to display or hide the collection descriptions by using the Show descriptions option. Collection descriptions will only show if Text style is set to Under images.